Bomber, fast-drying recycled nylon shorts with an elastic stretch waist for exceptional fit and comfort; 10" inseam. Everything we love about the Guidewater Pants, and less. The shorts version has all the same water-specific features – including a zippered side-leg pocket and a remarkably fast dry time – that make these the fishing shorts of choice for anglers. 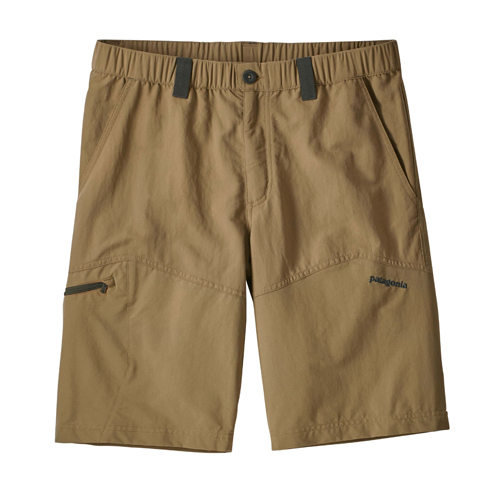 And the comfortable fit, zippered fly and constructed elastic waist and with durable belt loops make the Guidewater Shorts ideal for pretty much any activity. Which is to say, you may find yourself wearing ’em everywhere—we do. Now made from 4.3-oz, recycled nylon fabric with DWR (durable water repellent) finish and 50+ UPF sun protection. Inseam is 10". These are the best shorts I have found for hiking, climbing, rafting, and other outdoor activities. They are light weight, flexible, tough, quick to dry, and have multiple zippered storage pockets. They also look incredible. Patagonia Men's Sandy Cay Shorts 8"